Thick-It AquaCare H2O Thickened Water from HealthyKin.com comes from an Artesian mineral water well, 600 feet below ground in Superior, Wisconsin. This pure, pristine water is thickened with xanthan gum resulting in a thickened water that is clear, tastes natural and has no masking agents or flavor additives. It contains no calories or carbohydrates, which may make it an appropriate thickened beverage for people with diabetes or weight management issues. Ready-to-drink, chill, open and serve; no mixing required. This water is good for those who need it. You have the best price and fastest service that I have found so far. Best price for this product! Prompt service and product is packaged well. Thanks! My husband has dysphasia and can only use thickeden drinks. He is very satisfied with the AquaCare thickened water. He does add a few drops of some flavoring such as Mi0 water enhancer. The order from HealthyKin always arrives very promptly and in good condition. Very good product - much better than the others because it's made with artesian water doesn't have the additives that the other nectar thick waters have. Fast shipping and good price. 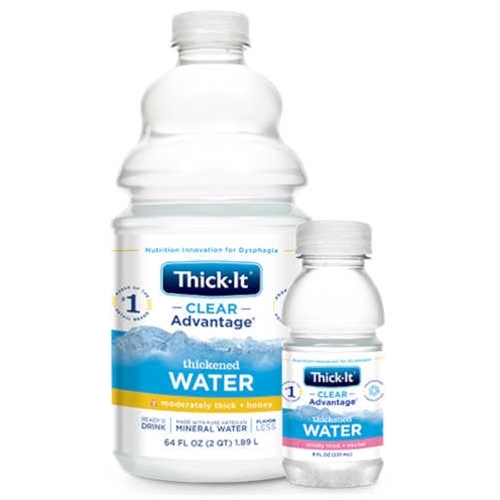 Would recommend for people who need thickened water. Very good product. The price is good and the shipping is fast. Will continue to order this item. My father did not like it. He said he couldnt afford to use 2 bottles to make one cup of coffee. The shipping was fast but the product not so good for his situation anyways. Best prethickened water. Good price. Good flavor. This is the best thickened water. Much better than trying to thicken it myself and than other brands.